Simply "Click" below to watch film! Is A CATCH IN TIME: CHAPTER ONE a visual story book? A dramatic short film? An art film? A dark thriller or Gothic horror? A beginning to an end, or a new beginning? An alternative history? An enhanced author reading? Or a cinematic companion for a complete novella? The answer is yes, it's all of the above. So sit back and simply enjoy this “audio” and “visual” intensive journey. Let it lead you into the storm. "Strangely enchanting. Unexpected, a real treat. Great for a young audience. I love Chris' innovation, he keeps me guessing all the time as an artist. He is unique in his approach. I recommend taking a trip down A CATCH IN TIME. A good place to venture when one needs to escape the modern day world for a while. Enjoyed it. Very clever editing too, I might add, on a technical level." 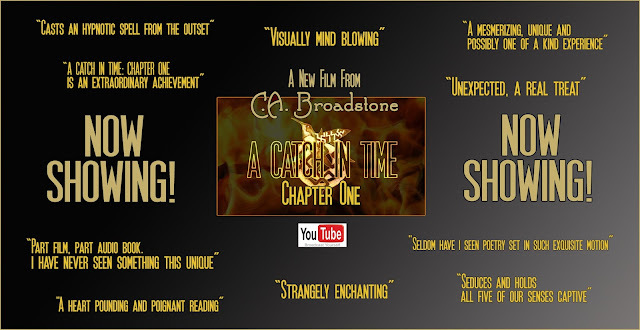 "A heart pounding and poignant reading of the eerie A CATCH IN TIME. With the haunting breath of those old time radio horror stories, Christopher Broadstone again delivers his story in such a way as to seduce and hold all five of our senses captive. You'll smell Tatiana's alluring scent and share her horror as this dramatic reading plays out and manipulates your mind." "A CATCH IN TIME grew so vividly and beautifully absurd…I could not take my eyes off the book for long…C. 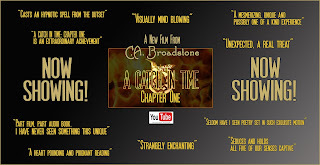 A. Broadstone has easily convinced me that his writing style is indeed brilliant." "A CATCH IN TIME speeds forward into that fever dream state that plays like a hallucination out of Dante’s Inferno..."